The Vasari Corridor is an interesting architectural concept. Built by the Medici Dukes to allow safe passage between their offices of business(The Uffizi) and the Pitti Palace, it is a symbol of their great wealth and increasing isolation from the populace. These days it serves as a museum and artists' self-portrait gallery, a tradition started by Cardinal Leopoldo de' Medici in the 17th century. It is now open to the public but only via guided tour, which must be arranged with the Uffizi (or affiliated tour operators). I myself did not get to see it on my trip to Florence, the intended day of my visit being marred by illness. Fortunately however, for myself and those that have not yet seen it, Andrew Graham-Dixon got to do the corridor walk in his superb 2008 series Travels With Vasari which aired on BBC Four. In this series AGD takes a deeper look into the life and work of Giorgio Vasari. Most famous as the first true art historian, but also an highly productive artist in his day. Vasari's Lives of the The Artists is often a first point of contact for those studying Renaissance art history. I am pleased that modern readers are now approaching Vasari with more objectivity - his tales are interesting, but often not a golden standard of historical documentation. 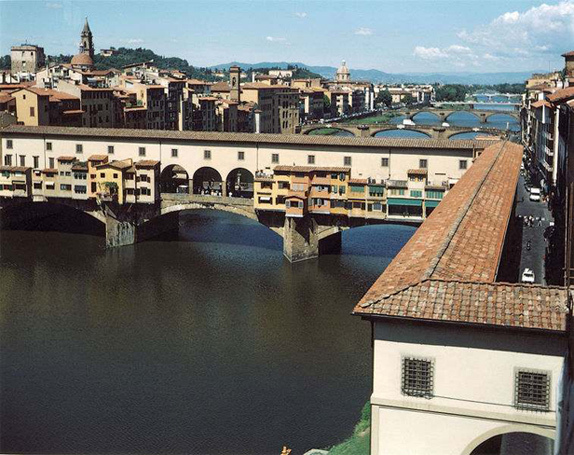 Vasari's biases and their influence on art history is something I will come back to in future posts, for now - enjoy this private tour of the Vasari corridor! The overwhelming emphasis on Leonardo, Michelangelo and Raphael was undoubtedly started by Vasari, who gave these particular three the rather dubious moniker of "Divine"
It was amusing to later find out that Michelangelo was not hugely impressed by his description by Vasari and penned his own at some stage. I love the work of this 'divine trinity' work too, but that degree of hyperbole is unnecessary! I'm always paranoid about scheduling tours in Italy. The overseas phone conversation is fraught with peril! This does sound cool, though. Who would Michelangelo be without Vasari? What? Michelangelo's works speak for themselves. In sculpture, the Pieta, the David, the Moses. Even the unfinished works in the Accademia in Florence are marvelous. He never claimed to be a painter but he gave us the Sistine chapel. Even Leonardo had to change his Madonna with St. Anne after viewing Michelangelo's Doni Tondo. Finally, throw in his prowess as an architect and poet. Please, for repentance you must undertake a pilgrimage to Florence and Rome. @Frank - I think M's point was quite sound - Vasari is Michelangelo's ultimate spin doctor. I wouldn't cite his efforts at poetry as an example of prowess though! Of course, he was a great multi-talent, but popular culture is so over saturated with his signature works, at the expense of other artists. I went and saw his David twice but had difficulty being moved. Not because it isn't a great work but because we simply have had it shoved in our faces far too much. It's too familiar! That entire saga of its creation has been drummed into us so much that it always gets out in front of Donatello, Cellini, Giambologna, Bernini, even later sculptors such as Canova. There was an article by UK art writer Jonathan Jones only recently - begrudgingly admitting that he has come to admire Canova after many years of passing him over in favour of Michelangelo - a great trick of Vasari's biases and the way they dominate modern perceptions of the renaissance and its subsequent eras. @Heidenkind. Your hotel can often arrange that and similar tours for you. If you're not fluent in Italian, I definitely recommend finding a hotel equipped to deal with English speaking travellers. I would like to apologize to M for my sloppy writing. I was being playful when I suggested that she go on a penitential pilgrimage, a la one of Chaucer's pilgrim's, to Florence and Rome. I did not mean to suggest that she was unfamiliar with Michelangelo's work. H: If writer's like Jonathan Jones pass over Canova because of Michelangelo, it is their problem, not Vasari's. Too often scholars fail to even look at the works they are viewing because of their pre=conceived notions. That's not Michelangelo's fault. Vasari is a gold mine for studies of renaissance art but all scholars know that he must be taken with a grain of salt. But, if he had never written his Lives, Michelangelo would still be a great artist. You find the best videos! I always have wondered why Mich wanted his biography rewritten. Maybe Vasari took too many liberties or maybe Mich just wanted his version of events down and a biographer he could control? what do you think? Hi everyone. I didn't mean to undermine Michelangelo's work in my comment (I tried to make that point clear, but perhaps the sentiment didn't come across well). I simply wanted to bring up two points: 1) that Vasari helped give Michelangelo the platform of popularity that the artist still enjoys today and 2) cause people to wonder what would have happened if Vasari hadn't discussed Michelangelo (or had been more reserved in his admiration for the artist). In regards to my first point, I was looking at this from a historical perspective. Vasari's "Lives" was widely popular (and biographies for other artists began to be written all over Europe). Because of "Lives," people could learn about Michelangelo without traveling to Florence or Rome. Such widespread admiration for Michelangelo exists because Vasari began to disseminate such praise for the artist through print. Obviously, Michelangelo was important to those who had seen his work, but not everyone in Europe would have access to the Sistine Chapel, for example. I am one of the lucky people who has studied Michelangelo in person. I spent several weeks in Italy (mostly Rome and Florence) as part of a university study abroad for art historians. His work is stunning and amazing - I had a particularly moving experience in front of his "Pieta" in St. Peter's. But I wouldn't have known about Michelangelo beforehand, if not for the books and publications about the artist. We are indebted to Vasari (sometimes called the "Father of Art History") for starting the publication trend. I just wonder what would have happened if he had chosen a different artist as the "culmination" of all Renaissance actions and endeavors. If Vasari had chosen da Vinci as his focal point and favorite artist, wouldn't that have changed the perception of readers who picked up "Lives" (especially those who had never seen the work for any of these artists)? I think so. Cheers for the 'frank' discussion M and Frank! @M - Cheers for the links. They are among my favourite posts at Alberti's Window!! @Frank - I think that's an interesting point! I don't think Vasari was being malevoelent in his warping of the truth, just writing it in the style he thought was appropriate at the time. If it's anyones fault, its subsequent teachers of his work. Whilst true scholars do of course look at *everything* with a grain of salt, a lot of us - myself included - are introduced to Vasari in high school and have not yet been trained with the tools of the scientific method, nor even of critical enquiry. All we have to go on are what our teachers tell us at that tender young age, when our teenage minds are perenially distractable! I cannot speak for Mr Jones, but I can quite firmly say in my own case that not being introduced to Vasari's flaws, his biases haunted me for much longer usual. I think there are parts of the world(so obvious I won't name them) that are very much still under the spell of these biases. @Bearded Lady- you're definitely onto something there about why Michelangelo was not as hugely impressed by Vasari's Lives. For more information, listen to this great podcast I hosted via BBC Radio. Where DO you get these videos? They're fabulous! I love how when he first entered the corridor, he began whispering in excitement then caught himself and started using his "presenter" voice. That one moment of awe and joy was priceless! I LOVE your observation Vicky! I noticed that too!! This is something that I really like about AGD - even with his many years of knowledge and experience, he still is able to convey his fascination with what he is presenting. There is an emotional counterpoint to what he does that resonates with a lot of people. I have posted some of these moments before: him modestly pointing out to Dr. Hawass the Fayum mummies in the Cairo Museum, the tense moment with the Dominican Monk about Savonarola. There are so many more - I will try post some in future!